Hey there loyal blog readers! 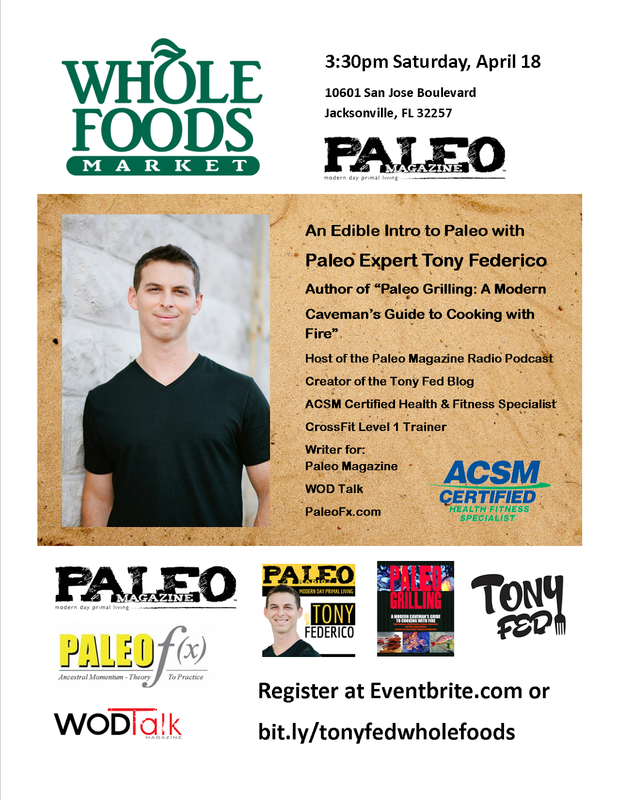 This Saturday I'll be heading to the Jacksonville Florida Whole Foods for a Paleo recipe sampling and information session. I've done food demos and cooking lessons at this Whole Foods in the past, and the team there really supports Paleo. Show them that you appreciate their Paleo-friendly endeavors by joining me for an hour of food, fun, and Paleo geekery! If you would like to register, simply go to EventBrite.com and search for "Paleo" in Jacksonville, FL. Or, you can just click on this link! This is a great place organize an event; they have great staff and great events put on here! I had nothing but great times and great conversations there. They served slider and shrimp cakes as appetizers at party halls in Boston MA with chicken skewers, and eggrolls that had veggies on the inside and some kind of creamy fruit sauce on top. Been there!!! It was a great event!!! Thanks guys! !